From Tamarind & Saffron by Claudia Roden (Penguin, £12.99) This is a rustic country salad of Syria and Lebanon. The key flavour is sumac, a spice made from the dried berries of the bush, Rhus coriaria. The berries are dried in the sun, then ground and sifted to produce a coarse-textured powder. It has a pleasing, lemony taste and is also used in stuffings, egg dishes, and to top grilled fish and meat. Cut open the pitta breads and toast them under the grill until they are crisp, turning them over once. Break them into small pieces in your hands. Put all the vegetables and herbs into a large bowl. For the dressing, mix the olive oil with the lemon juice, garlic, salt, pepper and sumac. 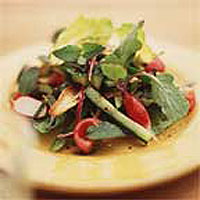 Just before serving, add the toasted bread to the vegetables and toss well with the dressing.